At breakfast or anytime, the classic Danish treat always pleases. And in this just-right, two-bite® size, traditional turns terrific. 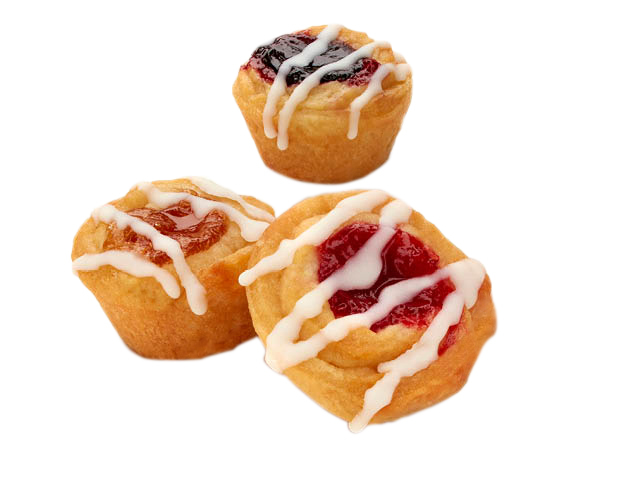 Our two-bite® Danish is made the time-tested, traditional way: from scratch. Inside you’ll find your choice of real fruit or smooth cream cheese. 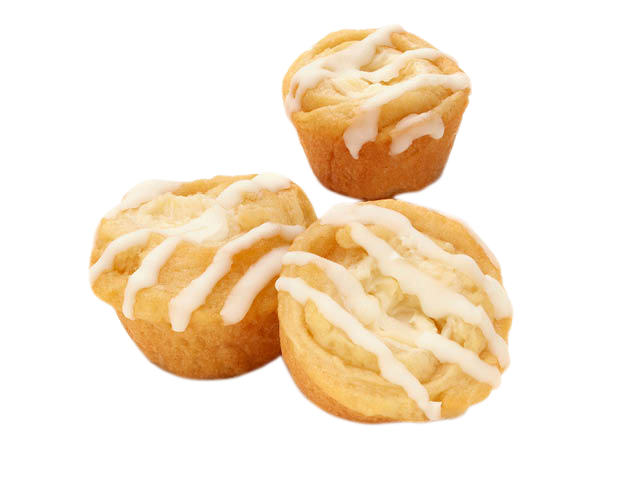 We bake ‘em up, add a sweet honey glaze, then finish with a light drizzle of yummy yogurt icing. And then you get to enjoy them. One bite. two-bites. Have another! 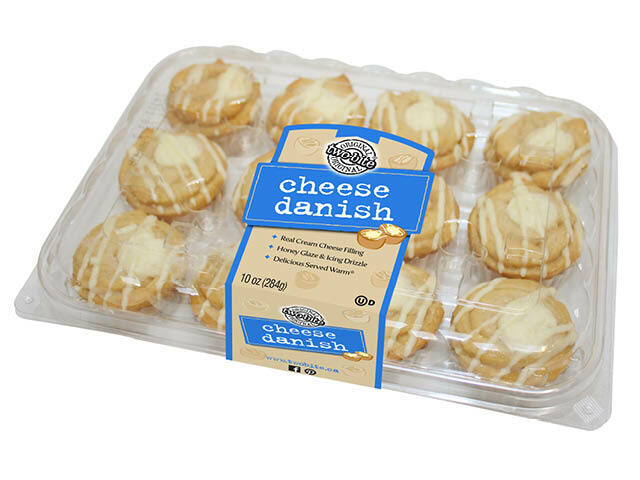 Soft Danish dough rolled with a real cream cheese filling. INGREDIENTS: ENRICHED WHEAT FLOUR (WHEAT FLOUR, NIACIN, REDUCED IRON, THIAMINE MONONITRATE, RIBOFLAVIN, FOLIC ACID), WATER, SUGAR, HIGH FRUCTOSE CORN SYRUP, SHORTENING (CANOLA, SOYBEAN, PALM, MODIFIED PALM AND PALM KERNEL OIL), CREAM CHEESE (CREAM, SKIM MILK, BACTERIAL CULTURE, SALT, CAROB BEAN GUM), EGG, HONEY, PECTIN, MODIFIED PALM AND PALM KERNEL OIL, WHEY POWDER, MARGARINE [SOYBEAN AND MODIFIED PALM OIL, WATER, SALT, WHEY POWDER, SOYBEAN LECITHIN, MONOGLYCERIDES, NATURAL FLAVOR, VITAMIN A PALMITATE, VITAMIN D3, COLOR (ANNATTO)], GLUCOSE, YEAST, SALT, MODIFIED CORN STARCH, CORN SYRUP, POTATO STARCH, BUTTER (CREAM, SALT), WHOLE MILK POWDER, YOGURT POWDER, CALCIUM PROPIONATE, POTASSIUM SORBATE AND SODIUM BENZOATE (PRESERVATIVES), MALTED BARLEY SYRUP, SOYBEAN LECITHIN, INVERT SUGAR, NATURAL AND ARTIFICIAL FLAVOR, CITRIC ACID, COLOR (FD&C YELLOW #5, FD&C YELLOW #6, TITANIUM DIOXIDE), SODIUM ALGINATE, MONO AND DIGLYCERIDES, CARAMEL SYRUP, AGAR, SODIUM STEAROYL LACTYLATE, TARTARIC ACID, SODIUM CITRATE, CAROB BEAN GUM, XANTHAN GUM, CARRAGEENAN, GELLAN GUM, ENZYMES, ASCORBIC ACID, SORBITAN MONOSTEARATE, POLYSORBATE 60. 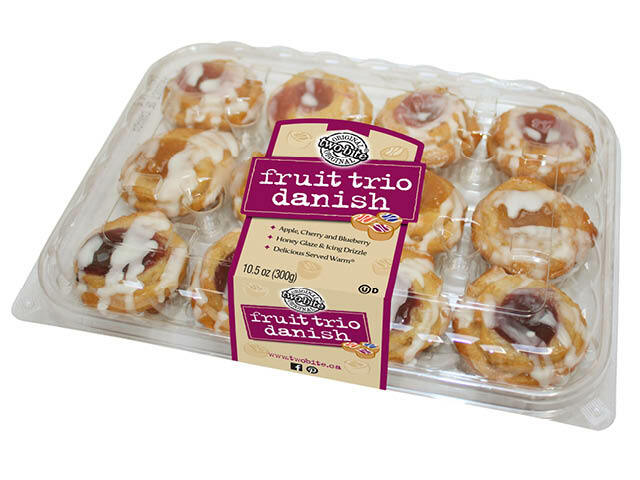 Mini Danish are topped with delicious real fruit fillings like apple, cherry and blueberry. INGREDIENTS: ENRICHED WHEAT FLOUR (WHEAT FLOUR, NIACIN, REDUCED IRON, THIAMINE MONONITRATE, RIBOFLAVIN, FOLIC ACID), WATER, SUGAR, SHORTENING (CANOLA, SOYBEAN, PALM, MODIFIED PALM AND PALM KERNEL OIL), DRIED APPLES, CHERRIES (MAY CONTAIN PITS), BLUEBERRIES, EGG, HONEY, PECTIN, MODIFIED PALM AND PALM KERNEL OIL, WHEY POWDER, MARGARINE [SOYBEAN AND MODIFIED PALM OIL, WATER, SALT, WHEY POWDER, SOYBEAN LECITHIN, MONOGLYCERIDES, NATURAL FLAVOR, VITAMIN A PALMITATE, VITAMIN D3, COLOR (ANNATTO)], GLUCOSE, YEAST, SALT, MODIFIED CORN STARCH, CORN SYRUP, POTATO STARCH, BUTTER (CREAM, SALT), WHOLE MILK POWDER, YOGURT POWDER, SPICE, CALCIUM PROPIONATE, POTASSIUM SORBATE AND SODIUM BENZOATE (PRESERVATIVES), MALTED BARLEY SYRUP, SOYBEAN LECITHIN, INVERT SUGAR, NATURAL AND ARTIFICIAL FLAVOR, CRYSTALLINE FRUCTOSE, CITRIC ACID, COLOR (FD&C RED #3, FD&C BLUE #1), SORBITOL, SODIUM ALGINATE, MONO AND DIGLYCERIDES, CARAMEL SYRUP, AGAR, SODIUM STEAROYL LACTYLATE, SODIUM CITRATE, CAROB BEAN GUM, GELLAN GUM, CARRAGEENAN, XANTHAN GUM, ENZYMES, ASCORBIC ACID, SORBITAN MONOSTEARATE, POLYSORBATE 60.